BTC packages with thermal pads present a myriad of challenges. A recent approach to BTC PCB land pattern design is the use of an SMD Window. This article shows the construction of such a land pattern and results after reflow. BTC's (Bottom Termination Components) are everywhere. These are the devices with terminations / leads hidden under the package and often have large thermal / ground pads in the center. We use them extensively on all new designs and are continually seeking to develop the best process possible to produce low cost, reliable, high quality solder joints with a low percentage of voiding. This article reviews a subset of our process and results with Texas Instrument's DP83867CS Gigabit Ethernet PHY device. This device is packaged in a 7 mm2 48-pin QFN package with a 4.1 mm2 thermal pad. For this type of package, we have adopted a methodolology of creating SMD (solder mask defined) windows for the thermal pad. Our in-house CAE tool is Altium Designer, and we build our BTC footprint using their IPC Footprint Wizard followed by manual customizations for the thermal pad and some additional fine tuning of the footprint features. We find that we can quickly build customized BTC footprints in a matter of minutes using this process. Eliminate solder wicking down the thermal pad vias by blocking it with solder mask windows. Note that some manufacturers still recommend this basic footprint for their BTCs / QFN packages. We consider this a quick and dirty approach. The primary disadvantage with this approach is that solder can run down the via holes during reflow, create shorts on the wiring side, and also impact the quality of the connection to the thermal pad. The upper left SMD window is drawn first using a single polygon region. Before placing the polygon, we perform all the geometry calculations. We strive to keep board cost to a minimum, but we also choose a PCB fabricator that can deliver things like high quality 8 mil drill holes and 6 mil solder mask webbing. Manually set the solder mask for each via, so they are not tented. Copy the new SMD window solder paste polygons and paste them on the solder paste layer. Note that you may wish to reduce your solder paste openings. The figure below shows an X-ray image that we took of our device and footprint after the board was run using our in-house quick-turn process. Note that we utilize vapor phase batch ovens for reflow, and the X-ray image utilized 80kV power. We're encouraged by the results, but also working to improve the process. Manufacturing: Pattern Recognition's Performance Depends on Search Window Size and Minimization of … An analysis of pattern recognition's dependence on search window size and error minimization during a pick & place operation with a 7 mm2 QFN device is discussed. 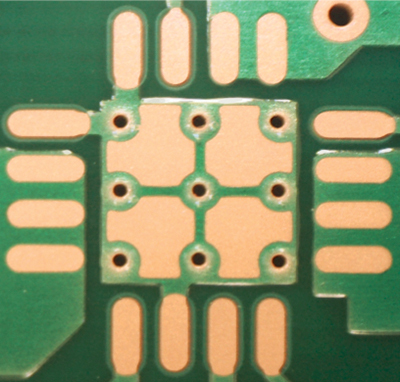 Hi Chandru, Some things to look at: too much solder paste deposited on the thermal pad, warped PCB, or non-uniform pads & stencil apertures causing the package to lift or dip on one side / corner. What type of package are you using? Are the land pattern pads uniform around the device?